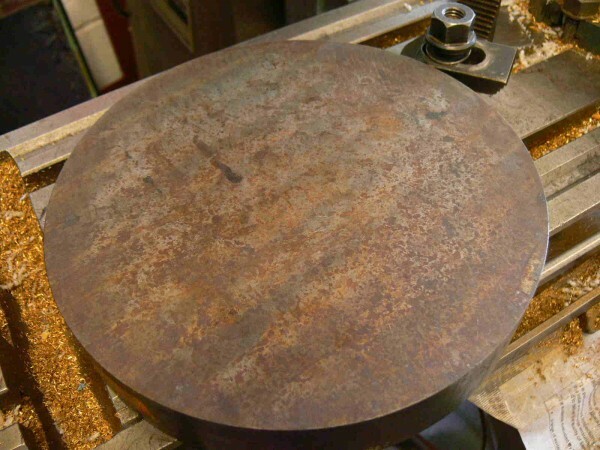 I have a disc of cast iron previously machined and scraped flat, it is eight inch diameter say one and a half inches thick and which I use as a stable surface to help assemble and check for parallelism of my richard kell honing guide stainless rods. But now it needs a re-vamp, looks a bit sorry for itself; an excellent excuse to do some engineers hand scraping, something only self taught (but doesn't that go for so many things in life). Be careful when googling for 'hand scraping' as with many things workshop there is a lot of nonsense, half-baked misinformation out there. 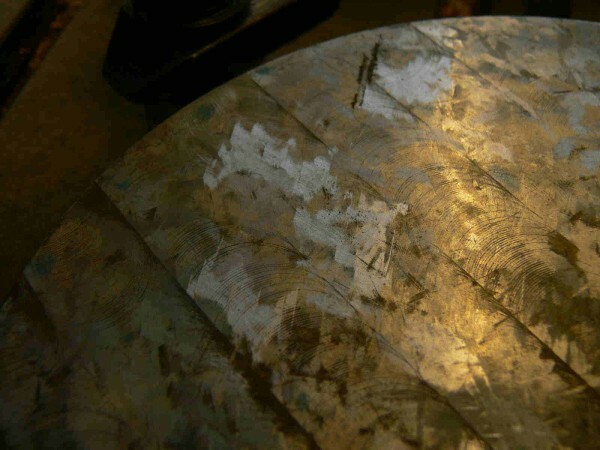 Everything i'm talking about on this post is referred back to an inspection surface plate, its not just making pretty patterns. Scraping falls basically into two areas, to aid oil retention as to build a Beilby Layer on machine tool slideways and scraping to get closer to a flat surface as defined by your surface plate. The three hours flew by, it can become so absorbing, but i have utmost sympathy for men stuck on this work fulltime. Its actually strenuous, hard work and goodness knows how arms, tendons and ones back would fare. 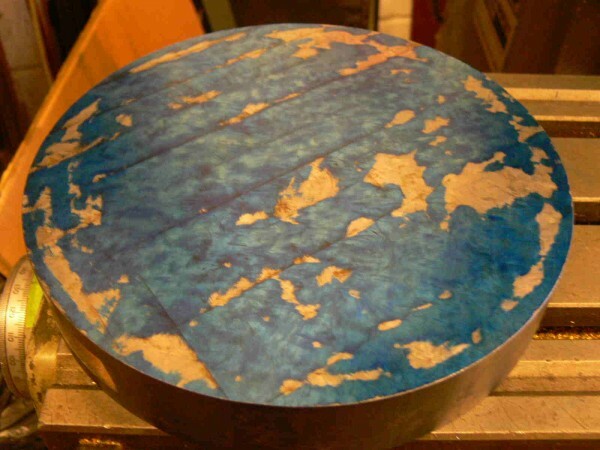 The real hard work would for instance have been to achieve the 'Whitworth three plate method' in producing a verifiable flat surface or set of three master surface plates as we all know from textbooks. What a clever man .... https://en.wikipedia.org/wiki/Joseph_Whitworth ... and my heart goes out to those men engaged on any work such as this, the actual men that did the work. The easiest example is here where I scrape a simple flat surface against a known reference ie the surface plate, but also for more sophisticated and difficult applications we could scrape to produce dovetail surfaces that would be our best chance of creating accurate and lasting sliding surfaces for machine tool bedways, creating a correct a form of 'running in' and thus enabling the Bielby layer to develop, a very thin 'bedded-in' surface layer measured in millionths of an inch that is extremely low friction as in (and is needed) in machine tool slideways. Correctly run-in surfaces are both so bright and low friction we read that the initial scraped surface help hold the lubricant so that the Bielby layer can be developed. 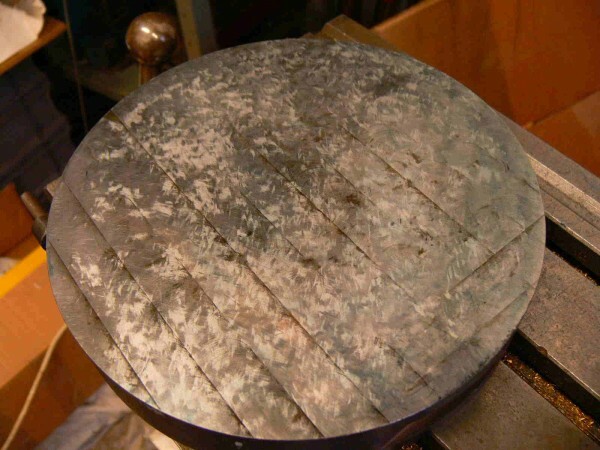 Something of this phenomena is shown at the end of the exercise when we reach a close approximation of flatness, the heavy CI disc 'floats' for a second or two when laid carefully back onto the surface plate. I had previously machined the disc both length and crossways ie X and Y axis on the Bridgeport milling machine, these still show after the finished session of scraping but as they are undetectable to touch they must I think be less than say a quarter thou inch. I use a fourteen inch hand file ground at its working end and honed on the arkansas stone to do the scraping. Heft and weight do matter a lot in this activity, as with all hand tools and often forgotten these last eighty years in 'making it cheaper'. The M&W commercial scrapers sold years ago which my dad had a set (still here) are little more than over-priced de-burring tools, the 'three square' pattern is particularly offensive and useless for anything. I've blogged on this before, see tags at right. And often the best de-burring tools are ones you make yourself, with long experience comes the intuitive insight into how tools cut, this applies to lathework, any machine tool and handwork. This finer points of insight (and a craftsmans development) can no longer exist when CNC rules. I realise the need of CNC for modern manufacturing, its the only way however I'm lucky I can choose a time era that maximises my enjoyment of the craft. 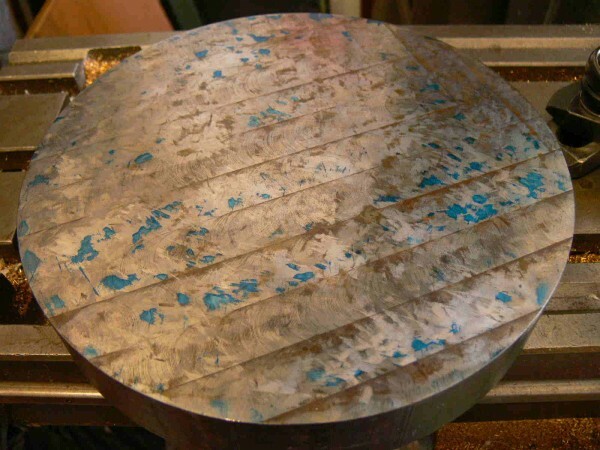 Machined slots at the side of the disc allow me to clamp it onto the Bridgeport table to resist the scraping pressure therefore I get 100% access to the surface in question. Here above we can see some initial material removed. It is random, but it is controlled, hard to explain until one has actually done it firsthand. This surface plate came from Robsons Marine Engineers at Seahouses in the late 1960's. I can remember quite clearly going down with my dad to look at the contents, an old standstone building in a back lane above the harbour. Forty properly fifty years later the village provides happy memories of autumn and winter nights, doing kids stuff, our lane North Lane being so quiet (safe) and devoid of traffic. My dads employers at the quarry group at that time were Thomas Tilling (previously Mark Appleby) at Easington Quarry, Belford, Northumberland and had purchased the remaining tools and tackle that remained in the old sandstone building. My dad told me the micrometers, calipers, hand tools etc had long since gone, thieves probably. 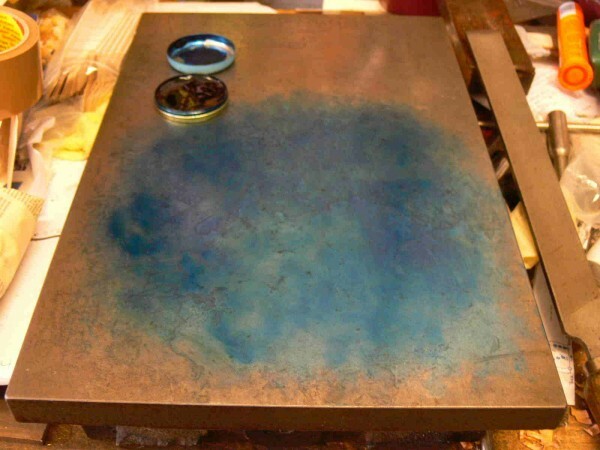 This surface plate probably was still there as too heavy for scoundrels to run away with. As a kid occasionally going to quarries around Northumberland on Sundays with my Dad when the plant was down it gave me an insight to the more remote quieter areas of this county, I now see I was lucky. I have a very distinct memory of hand grinding valves (endlessly ?) into cylinder heads ie spinning with your palms the wooden rod with a rubber suction cup for grip, it seemed to go on forever and theres lots of them in one engine, yet I was delighted to be part of the working mans world, my Dads world. He served me well, it was impressed upon me the importance of work, to learn, to develop, to make an effort; there never was any hanging around on street corners for me ! At right of the surface plate is the fourteen inch hand file doctored to make into a scraper, a diabolical useless and not very good product bought new many years ago at high expense, its from Oberg Sweden as a handfile, supposedly a high end product but in fact total crap. Diabolical because it 'skates' like mad over the surface and is most reluctant to cut when functioning as a hand file, a very good example of a badly cut hand file; will have cost me lots when i first started self-employment !! Far better go to the scrapyard and see what they have to offer for a scraper ie a big 'massy' discarded file or for a working file look around for Spanish or Indian hand files which can give better service at a fraction of the cost, ie 'bite' and not skating uselessly as per the expensive Oberg above. Beware also of the crappy file handles made unbelievably from Ramin, the absolute worst choice for this purpose, chosen because its so easy to rapidly machine turn but useless for its purpose, it splits the instance you fit a tang ! Loony thinking. I use elm from discarded or roadside offcuts. Also in the above theres far too much engineers blue but useful for photo purposes and shown before I rub it thin into a more useful state (done with the palm of ones hand). A rag has lint, this would foul up the whole procedure, a complete no-no. You need to feel it is clean. Heres what to avoid, far too much blue on the surface plate, very much false results, usually where beginners trip up from the little I've seen online. I avoid online workshop vids like the plague, so many are full of errors and mis-assumption, no rigour of thinking, just as in the over-blued example above. The trickier edges i try to scrape but its not easy, a dead smooth worn six inch hand file copes with it, procedure is to attend to all the blued 'high-spots' individually, better shown as per below, remembering not to repeat the same 'angle of attack' between scraping sessions. Above, here we are proceeding nicely, with hindsight I should have taken a deeper cut for the first couple of 'all-overs' to break the old surface and eliminate the remains of the machining. Thats the three hours done, need to get back onto production work, it will do well enough for what I want; feels incredibly uniform despite the lines visible and has developed the amazing property (expected from previous sessions) of floating on air for the first couple of seconds as it is laid face down onto the surface plate. postscript ..... But it bugs me that those machining tracks still show even though i cannot feel them from finger touch so as this even a couple of months later still 'bugs me' I shall repeat the process and get it to what I want, in other words greater rigour is needed. If I'd had someone do this for me i would not have let it pass!